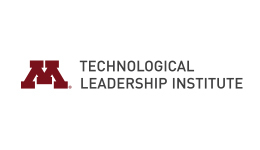 As a leader in Minnesota’s high-tech business industry, the Technological Leadership Institute (TLI) bridges the knowledge gap between business and technology by taking bright individuals and producing global leaders. Founded in 1987, TLI is an interdisciplinary center created with an endowment from the Honeywell Foundation. TLI’s endowed faculty chairs and more than 40 faculty members from across eight University of Minnesota colleges, government, and industry bring an exceptionally rich learning environment for the career development needs of its students and technical professionals.